What is the Blood of Jesus Christ? We do well at the outset to ponder this question. The object of these studies is to show that it is something very different from the life of the average Christian. Indeed a consideration of the written Word of God—of the Sermon on the Mount for example—should lead us to ask whether such a life has ever in fact been lived upon the earth, save only by the Son of God Himself. But in that last saving clause lies immediately the answer to our question. The Apostle Paul gives us his own definition of the Christian life in Galatians 2:20. It is “no longer I, but Christ”. Here he is not stating something special or peculiar—a high level of Christianity. He is, we believe, presenting God’s normal for a Christian, which can be summarized in the words: I live no longer, but Christ lives His life in me. God makes it quite clear in His Word that He has only one answer to every human need—His Son, Jesus Christ. In all His dealings with us He works by taking us out of the way and substituting Christ in our place. The Son of God died instead of us for our forgiveness: He lives instead of us for our deliverance. So we can speak of two substitutions—a Substitute on the Cross who secures our forgiveness and a Substitute within who secures our victory. It will help us greatly, and save us from much confusion, if we keep constantly before us this fact, that God will answer all our questions in one way only, namely, by showing us more of His Son. We shall take now as a starting-point for our study of the normal Christian life that great exposition of it which we find in the first eight chapters of the Epistle to the Romans, and we shall approach our subject from a practical and experimental point of view. It will be helpful first of all to point out a natural division of this section of Romans into two, and to note certain striking differences in the subject-matter of its two parts. The first eight chapters of Romans form a self-contained unit. The four-and-a-half chapters from 1:1 to 5:11 form the first half of this unit and the three-and-a-half chapters from 5:12 to 8:39 the second half. A careful reading will show us that the subject-matter of the two halves is not the same. For example, in the argument of the first section we find the plural word ‘sins’ given prominence. In the second section, however, this changed, for while the word ‘sins’ hardly occurs once, the singular word ‘sin’ is used again and again and is the subject mainly dealt with. Why is this? It is because in the first section it is a question of the sins I have committed before God, which are many and can be enumerated, whereas in the second it is a question of sin as a principle working in me. No matter how many sins I commit, it is always the one sin principle that leads to them. I need forgiveness for my sins, but I need also deliverance from the power of sin. The former touches my conscience, the latter my life. I may receive forgiveness for all my sins, but because of my sin I have, even then, no abiding peace of mind. When God’s light first shines into my heart my one cry is for forgiveness, for I realize I have committed sins before Him; but when once I have received forgiveness of sins I make a new discovery, namely, the discovery of sin, and I realize not only that I have committed sins before God but that there is something wrong within. I discover that I have the nature of a sinner. There is an inward inclination to sin, a power within that draws to sin. When that power breaks out I commit sins. I may seek and receive forgiveness, but then I sin once more. So life goes on in a vicious circle of sinning and being forgiven and then sinning again. I appreciate the blessed fact of God’s forgiveness, but I want something more than that: I want deliverance. I need forgiveness for what I have done, but I need also deliverance from what I am. Thus in the first eight chapters of Romans two aspects of salvation are presented to us: firstly, the forgiveness of our sins, and secondly, our deliverance from sin. But now, in keeping with this fact, we must notice a further difference. In the first part of Romans 1 to 8, we twice have reference to the Blood of the Lord Jesus, in chapter 3:25 and in chapter 5:9. In the second, a new idea is introduced in chapter 6:6, where we are said to have been “crucified” with Christ. The argument of the first part gathers round that aspect of the work of the Lord Jesus which is represented by ‘the Blood’ shed for our justification through “the remission of sins”. This terminology is however not carried on into the second section, where the argument centers now in the aspect of His work represented by ‘the Cross’, that is to say, by our union with Christ in His death, burial and resurrection. This distinction is a valuable one. We shall see that the Blood deals with what we have done, whereas the Cross deals with what we are. The Blood disposes of our sins, while the Cross strikes at the root of our capacity for sin. The latter aspect will be the subject of our consideration in later chapters. “All have sinned” (Romans 3:23). “God commendeth his own love toward us, in that, while we were yet sinners, Christ died for us. 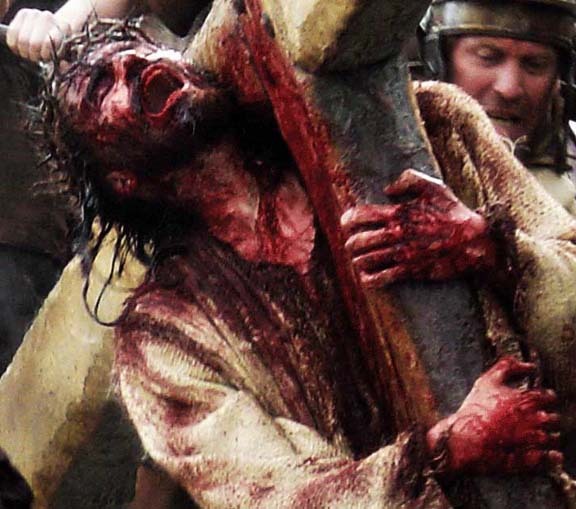 Much more then, being now justified by his blood, shall we be saved from the wrath of God through him” (Romans 5:8, 9). “Being justified freely by his grace through the redemption that is in Christ Jesus: whom God set forth to be a propitiation, through faith, by his blood, to shew his righteousness, because of the passing over of the sins done aforetime, in the forbearance of God; for the shewing, I say, of his righteousness at this present season: that he might himself be just, and the justifier of him that hath faith in Jesus” (Romans 3:24-26). We shall have reason at a later stage in our study to look closely at the real nature of the fall and the way of recovery. At this point we will just remind ourselves that when sin came in it found expression in an act of disobedience to God (Romans 5:19). Now we must remember that whenever this occurs the thing that immediately follows is guilt. Sin enters as disobedience, to create first of all a separation between God and man whereby man is put away from God. God can no longer have fellowship with him, for there is something now which hinders, and it is that which is known throughout Scripture as ‘sin’. Thus it is first of all God who says, “They are all under sin” (Romans 3:9). Then, secondly, that sin in man, which henceforth constitutes a barrier to his fellowship with God, gives rise in him to a sense of guilt—of estrangement from God. Here it is man himself who, with the help of his awakened conscience, says, “I have sinned” (Luke 15:18). Nor is this all, for sin also provides Satan with his ground of accusation before God, while our sense of guilt gives him his ground of accusation in our hearts; so that, thirdly, it is ‘the accuser of the brethren’ (Rev. 12:10) who now says, ‘You have sinned’. To redeem us, therefore, and to bring us back to the purpose of God, the Lord Jesus had to do something about these three questions of sin and of guilt and of Satan’s charge against us. Our sins had first to be dealt with, and this was effected by the precious Blood of Christ. Our guilt has to be dealt with and our guilty conscience set at rest by showing us the value of that Blood. And finally the attack of the enemy has to be met and his accusations answered. In the Scriptures the Blood of Christ is shown to operate effectually in these three ways, Godward, manward and Satanward. There is thus an absolute need for us to appropriate these values of the Blood if we are to go on. This is a first essential. We must have a basic knowledge of the fact of the death of the Lord Jesus as our Substitute upon the Cross, and a clear apprehension of the efficacy of His Blood for our sins, for without this we cannot be said to have started upon our road. Let us look then at these three matters more closely. The Blood is for atonement and has to do first with our standing before God. We need forgiveness for the sins we have committed, lest we come under judgment; and they are forgiven, not because God overlooks what we have done but because He sees the Blood. The Blood is therefore not primarily for us but for God. If I want to understand the value of the Blood I must accept God’s valuation of it, and if I do not know something of the value set upon the Blood by God I shall never know what its value is for me. It is only as the estimate that God puts upon the Blood of Christ is made known to me by His Holy Spirit that I come into the good of it myself and find how precious indeed the Blood is to me. But the first aspect of it is Godward. Throughout the Old and New Testaments the word ‘blood’ is used in connection with the idea of atonement, I think over a hundred times, and throughout it is something for God. In the Old Testament calendar there is one day that has a great bearing on the matter of our sins and that day is the Day of Atonement. Nothing explains this question of sins so clearly as the description of that day. In Leviticus 16 we find that on the Day of Atonement the blood was taken from the sin offering and brought into the Most Holy Place and there sprinkled before the Lord seven times. We must be very clear about this. On that day the sin offering was offered publicly in the court of the tabernacle. Everything was there in full view and could be seen by all. But the Lord commanded that no man should enter the tabernacle itself except the high priest. It was he alone who took the blood and, going into the Most Holy Place, sprinkled it there to make atonement before the Lord. Why? Because the high priest was a type of the Lord Jesus in His redemptive work (Hebrews 9:12), and so, in figure, he was the one who did the work. None but he could even draw near to enter in. Moreover, connected with his going in there was but one act, namely, the presenting of the blood to God as something He had accepted, something in which He could find satisfaction. It was a transaction between the high priest and God in the Sanctuary, away from the eyes of the men who were to benefit by it. The Lord required that. The Blood is therefore in the first place for Him. Earlier even than this there is described in Exodus 12:13 the shedding of the blood of the passover lamb in Egypt for Israel’s redemption. This is again, I think, one of the best types in the Old Testament of our redemption. The blood was put on the lintel and on the door-posts, whereas the meat, the flesh of the lamb, was eaten inside the house; and God said: “When I see the blood, I will pass over you”. Here we have another illustration of the fact that the blood was not meant to be presented to man but to God, for the blood was put on the lintel and on the door-posts, where those feasting inside the house would not see it. It is God’s holiness, God’s righteousness, which demands that a sinless life should be given for man. There is life in the Blood, and that Blood has to be poured out for me, for my sins. God is the One who requires it to be so. God is the One who demands that the Blood be presented, in order to satisfy His own righteousness, and it is He who says: ‘When I see the blood’, I will pass over you.’ The Blood of Christ wholly satisfies God. Now I desire to say a word at this point to my younger brethren in the Lord, for it is here that we often get into difficulties. As unbelievers we may have been wholly untroubled by our conscience until the Word of God began to arouse us. Our conscience was dead, and those with dead consciences are certainly of no use to God. But later, when we believed, our awakened conscience may have become acutely sensitive, and this can constitute a real problem to us. The sense of sin and guilt can become so great, so terrible, as almost to cripple us by causing us to lose sight of the true effectiveness of the Blood. It seems to us that our sins are so real, and some particular sin may trouble us so many times, that we come to the point where to us our sins loom larger than the Blood of Christ. Now the whole trouble with us is that we are trying to sense it; we are trying to feel its value and to estimate subjectively what the Blood is for us. We cannot do it; it does not work that way. The Blood is first for God to see. We then have to accept God’s valuation of it. In doing so we shall find our valuation. If instead we try to come to a valuation by way of our feelings we get nothing; we remain in darkness. No, it is a matter of faith in God’s Word. We have to believe that the Blood is precious to God because He says it is so (1 Peter 1:18, 19). If God can accept the Blood as a payment for our sins and as the price of our redemption, then we can rest assured that the debt has been paid. If God is satisfied with the Blood, then the Blood must be acceptable. Our valuation of it is only according to His valuation—neither more nor less. It cannot, of course, be more, but it must not be less. Let us remember that He is holy and He is righteous, and that a holy and righteous God has the right to say that the Blood is acceptable in His eyes and has fully satisfied Him. The Blood has satisfied God; it must satisfy us also. It has therefore a second value that is manward in the cleansing of our conscience. When we come to the Epistle to the Hebrews we find that the Blood does this. We are to have “hearts sprinkled from an evil conscience” (Hebrews 10:22). This is most important. Look carefully at what it says. The writer does not tell us that the Blood of the Lord Jesus cleanses our hearts, and then stop there in his statement. We are wrong to connect the heart with the Blood in quite that way. It may show a misunderstanding of the sphere in which the Blood operates to pray, ‘Lord, cleanse my heart from sin by Thy Blood’. The heart, God says, is “desperately sick” (Jeremiah 17:9), and He must do something more fundamental than cleanse it: He must give us a new one. We do not wash and iron clothing that we are going to throw away. As we shall shortly see, the ‘flesh’ is too bad to be cleansed; it must be crucified. The work of God within us must be something wholly new. “A new heart also will I give you, and a new spirit will I put within you” (Ezekiel 36:26). No, I do not find it stated that the Blood cleanses our hearts. Its work is not subjective in that way, but wholly objective, before God. True, the cleansing work of the Blood is seen here in Hebrews 10 to have reference to the heart, but it is in relation to the conscience. “Having our hearts sprinkled from an evil conscience”. What then is the meaning of this? It means that there was something intervening between myself and God, as a result of which I had an evil conscience whenever I sought to approach Him. It was constantly reminding me of the barrier that stood between myself and Him. But now, through the operation of the precious Blood, something new has been effected before God which has removed that barrier, and God has made that fact known to me in His Word. When that has been believed in and accepted, my conscience is at once cleared and my sense of guilt removed, and I have no more an evil conscience toward God. Every one of us knows what a precious thing it is to have a conscience void of offense in our dealings with God. A heart of faith and a conscience clear of any and every accusation are both equally essential to us, since they are interdependent. As soon as we find our conscience is uneasy our faith leaks away and immediately we find we cannot face God. In order therefore to keep going on with God we must know the up-to-date value of the Blood. God keeps short accounts, and we are made nigh by the Blood every day, every hour and every minute. It never loses its efficacy as our ground of access if we will but lay hold upon it. When we enter the most Holy Place, on what ground dare we enter but by the Blood? But I want to ask myself, am I really seeking the way into the Presence of God by the Blood or by something else? What do I mean when I say, ‘by the Blood’? I mean simply that I recognize my sins, that I confess that I have need of cleansing and of atonement, and that I come to God on the basis of the finished work of the Lord Jesus. I approach God through His merit alone, and never on the basis of my attainment; never, for example, on the ground that I have been extra kind or patient today, or that I have done something for the Lord this morning. I have to come by way of the Blood every time. The temptation to so many of us when we try to approach God is to think that because God has been dealing with us—because He has been taking steps to bring us into something more of Himself and has been teaching us deeper lessons of the Cross—He has thereby set before us new standards, and that only by attaining to these can we have a clear conscience before Him. No! A clear conscience is never based upon our attainment; it can only be based on the work of the Lord Jesus in the shedding of His Blood. What, after all, is your basis of approach to God? Do you come to Him on the uncertain ground of your feeling, the feeling that you may have achieved something for God today? Or is your approach based on something far more secure, namely, the fact that the Blood has been shed, and that God looks on that Blood and is satisfied? Of course, were it conceivably possible for the Blood to suffer any change, the basis of your approach to God might be less trustworthy. But the Blood has never changed and never will. Your approach to God is therefore always in boldness; and that boldness is yours through the Blood and never through your personal attainment. Whatever be your measure of attainment today or yesterday or the day before, as soon as you make a conscious move into the Most Holy Place, immediately you have to take your stand upon the safe and only ground of the shed Blood. Whether you have had a good day or a bad day, whether you have consciously sinned or not, your basis of approach is always the same—the Blood of Christ. That is the ground upon which you may enter, and there is no other. As with many other stages of our Christian experience, this matter of access to God has two phases, an initial and a progressive one. The former is presented to us in Ephesians 2 and the latter in Hebrews 10. Initially, our standing with God was secured by the Blood, for we are “made nigh in the blood of Christ” (Eph. 2:13). But thereafter our ground of continual access is still by the Blood, for the apostle exhorts us: “Having therefore… boldness to enter into the holy place by the blood of Jesus… let us draw near” (Heb. 10:19, 22). To begin with I was made nigh by the Blood, and to continue in that new relationship I come through the Blood every time. It is not that I was saved on one basis and that I now maintain my fellowship on another. You say, ’That is very simple; it is the A.B.C. of the Gospel.’ Yes, but the trouble with many of us is that we have moved away from the A.B.C. We have thought we had progressed and so could dispense with it, but we can never do so. No, my initial approach to God is by the Blood, and every time I come before Him it is the same. Right to the end it will always and only be on the ground of the Blood. This does not mean at all that we should live a careless life, for we shall shortly study another aspect of the death of Christ which shows us that anything but that is contemplated. But for the present let us be satisfied with the Blood, that it is there and that it is enough. We may be weak, but looking at our weakness will never make us strong. No trying to feel bad and doing penance will help us to be even a little holier. There is no help there, so let us be bold in our approach because of the Blood: ‘Lord, I do not know fully what the value of the Blood is, but I know that the Blood has satisfied Thee; so the Blood is enough for me, and it is my only plea. I see now that whether I have really progressed, whether I have really attained to something or not, is not the point. Whenever I come before Thee, it is always on the ground of the precious Blood. Then our conscience is really clear before God. No conscience could ever be clear apart from the Blood. It is the Blood that gives us boldness. “No more conscience of sins”: these are tremendous words of Hebrews 10:2. We are cleansed from every sin; and we may truly echo the words of Paul: “Blessed is the man to whom the Lord will not reckon sin” (Romans 4:8). In view of what we have said we can now turn to face the enemy, for there is a further aspect of the Blood which is Satanward. Satan’s most strategic activity in this day is as the accuser of the brethren (Rev. 12:10) and it is as this that our Lord confronts him with His special ministry as High Priest “through his own blood” (Hebrews 9:12). How then does the Blood operate against Satan? It does so by putting God on the side of man against him. The Fall brought something into man which gave Satan a footing within him, with the result that God was compelled to withdraw Himself. Man is now outside the garden—beyond reach of the glory of God (Romans 3:23)—because he is inwardly estranged from God. Because of what man has done, there is something in him which, until it is removed, renders God morally unable to defend him. But the Blood removes that barrier and restores man to God and God to man. Man is in favour now, and because God is on his side he can face Satan without fear. You remember that verse in John’s first Epistle—and this is the translation of it I like best: “The blood of Jesus his Son cleanses us from every sin” 111 John 1:7: Marginal reading of New Translation by J.N. Darby It is not exactly “all sin” in the general sense, but every sin, every item. What does it mean? Oh, it is a marvelous thing! God is the light, and as we walk in the light with Him everything is exposed and open to that light, so that God can see it all—and yet the Blood is able to cleanse from every sin. What a cleansing! It is not that I have not a profound knowledge of myself, nor that God has not a perfect knowledge of me. It is not that I try to hide something nor that God tries to overlook something. No, it is that He is in the light and I too am in the light, and that there the precious Blood cleanses me from every sin. The Blood is enough for that! Some of us, oppressed by our own weakness, may at times have been tempted to think that there are sins which are almost unforgivable. Let us remember the word: “The blood of Jesus Christ his Son cleanses us from every sin.” Big sins, small sins, sins which may be very black and sins which appear to be not so black, sins which I think can be forgiven and sins which seem unforgivable, yes, all sins, conscious or unconscious, remembered or forgotten, are included in those words: “every sin”. “The blood of Jesus his Son cleanses us from every sin”, and it does so because in the first place it satisfies God. Since God, seeing all our sins in the light, can forgive them on the basis of the Blood, what ground of accusation has Satan? Satan may accuse us before Him, but, “If God is for us, who is against us?” (Romans 8:31). God points him to the Blood of His dear Son. It is the sufficient answer against which Satan has no appeal. “Who shall lay anything to the charge of God’s elect? It is God that justifieth; who is he that shall condemn? It is Christ Jesus that died, yea rather, that was raised from the dead, who is at the right hand of God, who also maketh intercession for us” (Romans 8:33, 34). So here again our need is to recognize the absolute sufficiency of the precious Blood. “Christ having come a high priest… through his own blood, entered in once for all into the holy place, having obtained eternal redemption” (Hebrews 9:11, 12). He was Redeemer once. He has been High Priest and Advocate for nearly two thousand years. He stands there in the presence of God, and “he is the propitiation for our sins” (1 John 2:1, 2). Note the words of Hebrews 9:14: “How much more shall the blood of Christ…” They underline the sufficiency of His ministry. It is enough for God. What then of our attitude to Satan? This is important, for he accuses us not only before God but in our own conscience also. ‘You have sinned, and you keep on sinning. You are weak, and God can have nothing more to do with you.’ This is his argument. And our temptation is to look within and in self-defense to try to find in ourselves, in our feelings or our behavior, some ground for believing that Satan is wrong. Alternatively we are tempted to admit our helplessness and, going to the other extreme, to yield to depression and despair. Thus accusation becomes one of the greatest and most effective of Satan’s weapons. He points to our sins and seeks to charge us with them before God, and if we accept his accusations we go down immediately. Now the reason why we so readily accept his accusations is that we are still hoping to have some righteousness of our own. The ground of our expectation is wrong. Satan has succeeded in making us look in the wrong direction. Thereby he wins his point, rendering us ineffective. But if we have learned to put no confidence in the flesh, we shall not wonder if we sin, for the very nature of the flesh is to sin. Do you understand what I mean? It is because we have not come to appreciate our true nature and to see how helpless we are that we still have some expectation in ourselves, with the result that, when Satan comes along and accuses us, we go down under it. God is well able to deal with our sins; but He cannot deal with a man under accusation, because such a man is not trusting in the Blood. The Blood speaks in his favour, but his is listening instead to Satan. Christ is our Advocate but we, the accused, side with the accuser. We have not recognized that we are unworthy of anything but death; that, as we shall shortly see, we are only fit to be crucified anyway. We have not recognized that it is God alone that can answer the accuser, and that in the precious Blood He has already done so. Our salvation lies in looking away to the Lord Jesus and in seeing that the Blood of the Lamb has met the whole situation created by our sins and has answered it. That is the sure foundation on which we stand. Never should we try to answer Satan with our good conduct but always with the Blood. Yes, we are sinful, but, praise God! the Blood cleanses us from every sin. God looks upon the Blood whereby His Son has met the charge, and Satan has no more ground of attack. Our faith in the precious Blood and our refusal to be moved from that position can alone silence his charges and put him to flight (Romans 8:33, 34); and so it will be, right on to the end (Revelation 12:11). Oh, what an emancipation it would be if we saw more of the value of God’s eyes of the precious Blood of His dear Son! This entry was posted in Bible Teachings, Inspirational Messages and tagged blood of Jesus Christ, cross of christ, justification, penalty of sin, sin, what does the blood of christ accomplish?, what is the blood of cross. Bookmark the permalink.